Religion A Large Presence As U.S. Embassy Opens In Jerusalem The U.S. selected two evangelical Christians to offer prayers at a ceremony opening its new embassy in Jerusalem. 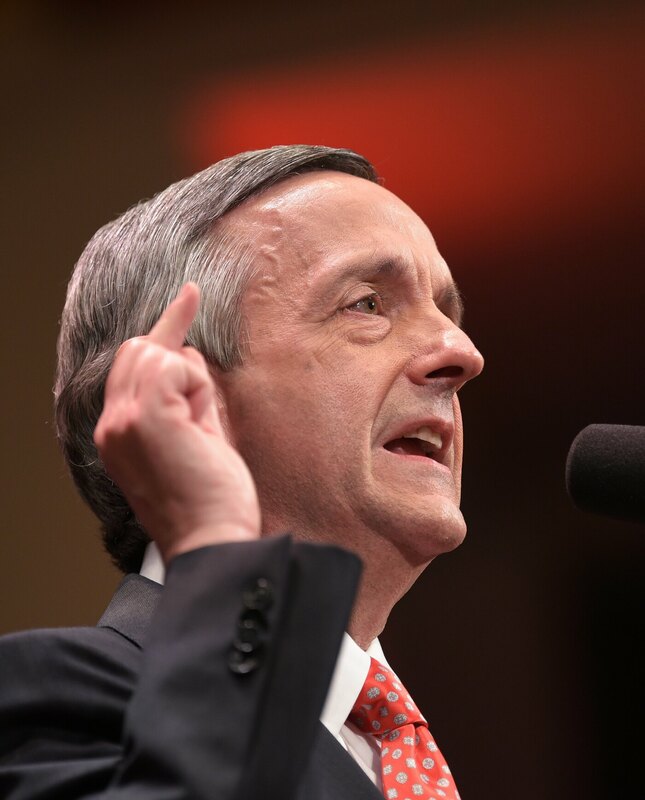 One of the pastors, Robert Jeffress, is known for dismissing other faiths. 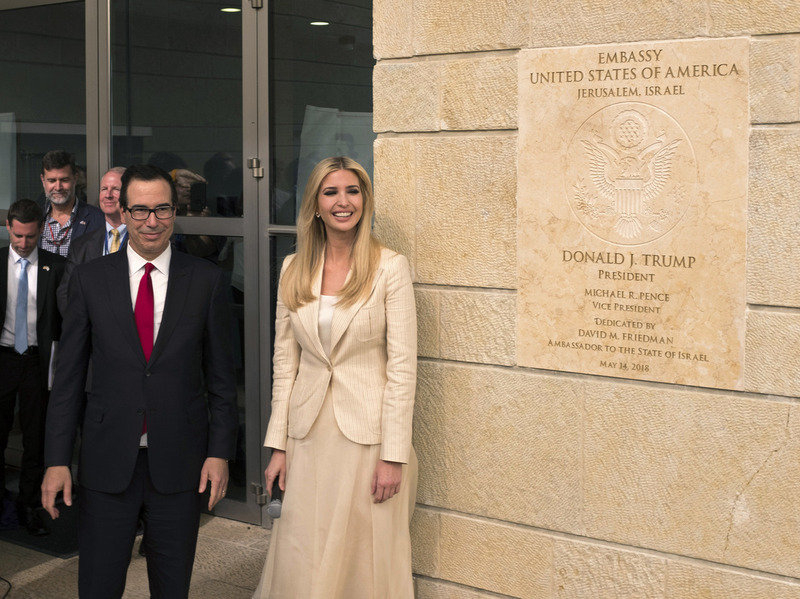 White House senior adviser Ivanka Trump and U.S. Treasury Secretary Steven Mnuchin unveil the entrance to the U.S. Embassy in Jerusalem. Robert Jeffress, pastor of the First Baptist Church in Dallas, Texas, has come under intense criticism for those comments, but he was also one of Donald Trump's earliest and most enthusiastic Christian supporters. In his prayer, while thanking God for protecting Israel, Jeffress managed to shower praise on the president. "We want to thank you for the tremendous leadership of our great president, Donald J. Trump," Jeffress said. "Without President Trump's determination, resolve and courage, we would not be here today." Jeffress is also a passionate supporter of the State of Israel, but in choosing him to give the opening prayer at the embassy, the Trump administration offended some who otherwise applauded the U.S. decision to recognize Jerusalem as Israel's capital. Pastor Robert Jeffress, seen here in July 2017, delivered the invocation at a ceremony marking the opening of the U.S. Embassy in Jerusalem. Jeffress is pastor of the First Baptist Church in Dallas. Mitt Romney, the former Republican presidential candidate, blasted Jeffress on Sunday in a tweet. "Such a religious bigot should not be giving the prayer that opens the United States Embassy in Jerusalem," Romney wrote. The Anti-Defamation League (ADL), which has long advocated moving the U.S. Embassy to Jerusalem from Tel Aviv, weighed in with similar criticism. "We are disappointed by the selection of Pastor Robert Jeffress to offer a prayer at the historic dedication of the American Embassy in Jerusalem," the ADL said Monday in a statement. "Jeffress is an unrepentant religious bigot who has a history of making hateful comments," the ADL said. "This is a moment when we should be trying to send out a message of hope, of peace and of inclusion, and that's not the message that many people associate with Pastor Jeffress," said Rabbi David Sandmel, the ADL's director of inter-religious engagement. Appearing on the "Fox and Friends" television program on Monday morning, Jeffress said remarks he has made in the past about Jews and others not going to heaven merely reflect Christian doctrine. "Historic Christianity for 2,000 years has taught that salvation is through faith in Christ alone," he said. "The fact that I and tens of millions of evangelical Christians still believe that is not bigoted, and it's not newsworthy." A White House spokesman, Raj Shah, noted that Jeffress has had "strong relationships with many people in the faith community, as well as folks in the [Trump] administration and Republicans on [Capitol] Hill, Democrats as well." But at least one Republican congressman objected to the invitations to Jeffress and to John Hagee, another evangelical Christian pastor, who gave the benediction at the embassy ceremony. "If it were me, it would be a radically different panel," said Rep. Francis Rooney of Florida, in an interview on CNN. Rooney, who served as the U.S. ambassador to the Vatican under President George W. Bush, objected in particular to past comments by both Jeffress and Hagee that were critical of the Roman Catholic Church. "I would rather have had a balanced scorecard," Rooney said. "It would have suited me to have had as broad a list of ecumenical speakers and participants as they could get." A State Department official, speaking on background, noted that Jerusalem "is a holy city for millions of people around the world. We sought to reflect that in this event." The Israeli government apparently had no objection to the role of Pastors Jeffress and Hagee at the embassy opening. Prime Minister Benjamin Netanyahu, speaking at the ceremony, quoted Zechariah 8:3, in which God promises "to return to Zion and dwell in the midst of Jerusalem." The Book of Zechariah happens to be a favorite of those Christians whose support for the State of Israel is based on a belief that the Bible prophesizes that when Jesus Christ returns to earth, it will be in Jerusalem.